The word ‘particuology’ was coined to parallel the discipline for the science and technology of particles. 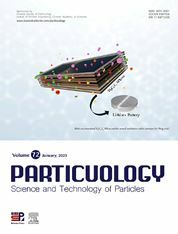 Particuology is an interdisciplinary journal that publishes frontier research articles and critical reviews on the discovery, formulation and engineering of particulate materials, processes and systems. It especially welcomes contributions utilising advanced theoretical, modelling and measurement methods to enable the discovery and creation of new particulate materials, and the manufacturing of functional particulate-based products, such as sensors. Papers are handled by Thematic Editors who oversee contributions from specific subject fields. These fields are classified into: Particle Synthesis and Modification; Particle Characterization and Measurement; Granular Systems and Bulk Solids Technology; Fluidization and Particle-Fluid Systems; Aerosols; and Applications of Particle Technology. Particle design and preparation including controlled response and sensing functionalities in formation, delivery systems and biological systems, etc. These topics are broadly relevant to the production of materials, pharmaceuticals and food, and to the conversion of energy resources to fuels and protection of the environment. With a focus on new learning related to complex multi-scale systems and phenomena, Particuology especially welcomes and now provides a platform for themes related to meso-science. This emerging field recognises that common phenomena can be observed across length scales ranging from elemental particles through to that of the observable universe. Since particulate systems are ubiquitous in various fields, this initiative extends the scope of the journal, while maintaining a focus on the common scientific challenges for these fields.